For those celebrating Thanksgiving this week, definitely have your family or friends pass the peas, please. Peas have been a common part the human diet for ages. Produced by the Pisum sativum plant, peas actually belong to the family Fabaceae, which are a group of pod-producing leguminous plants. So, although commonly regarded as vegetables, peas are actually legumes, not vegetables. Peas have a very impressive nutritional profile. They contain just about every essential vitamin and mineral we need for a smooth progression of physiological processes, not to mention a high fiber content. But the most notable feature of peas is probably its high protein content, which makes it one the best sources of plant-based protein. This high level of protein in peas comes with several benefits. Not only does it help improve bone health and muscle strength, it also plays a role in healthy weight management by controlling appetite. By working in tandem with the high fiber content, pea protein helps to keep the appetite under control by increasing the levels of appetite-reducing hormones, thereby reducing food cravings. Peas are also loaded with phenolic compounds, which are considered as natural antioxidants capable of providing some protection against diseases like cancer and other inflammatory diseases. There are various reasons why peas can help maintain a healthy heart and one of them is its high fiber content. Fiber-rich foods have been shown to reduce blood pressure and indicators of inflammation, while also improving the serum lipid levels. According to a study published in The Journal of Nutrition, which examined the effect of fiber preparations produced from pea cell wall on cardiovascular health, it was observed that subjects placed on the pea fiber diet showed a trend for lower postprandial triacyglycerol (TAG) responses compared with subjects on a low-fiber diet matched in macronutrient content. Peas also contain a decent amount of minerals such as calcium, magnesium and potassium, which have all been proven supporting the management of healthy blood pressure levels. Furthermore, green peas contain carotenoids, flavonols and vitamin C, which have all been shown to support cardiovascular health due to their cell-protecting capabilities. 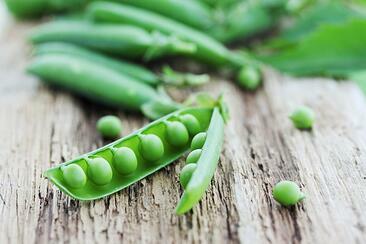 Peas possess several properties that may help to maintain proper levels of blood sugar. Peas have a low glycemic index (GI) and foods with a low GI have been proven helpful in blood-sugar regulation. Therefore, this low GI rank of peas makes them a healthy food choice for patients wanting to stabilize blood sugar levels. The high content of fiber and protein in peas play a major role in their ability to mediate glycemic response. The high fiber content results in a slower rate of carbohydrate absorption, which translates into a steadier rise in the level of blood sugar, instead of a sudden spike. Studies have also shown that protein-rich foods help to stabilize blood sugar levels in people with type-2 diabetes. Peas also contain a good amount of vitamins K, A, B and C, as well as the mineral, magnesium, which have all been shown to help with blood sugar regulation and support of healthy blood sugar levels. This holiday season, if you’re trying to eat a bit healthier than usual, pass on the rolls and butter, but don’t be shy with the peas.